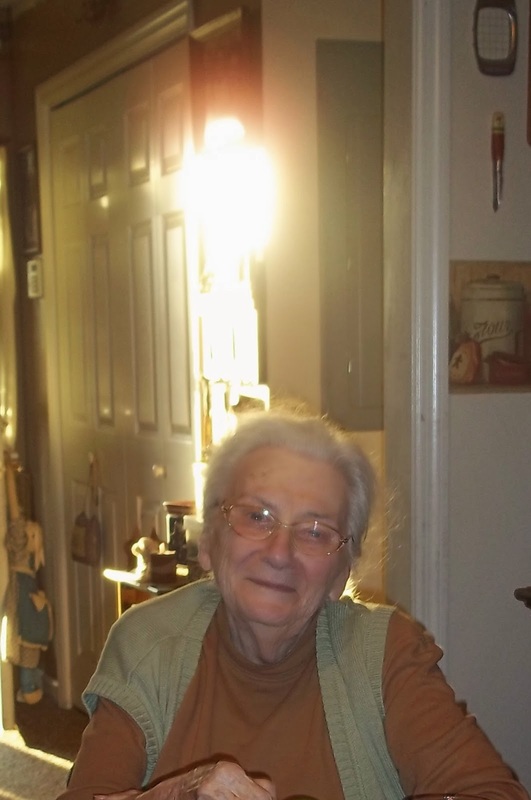 Homespun Devotions: Happy Birthday, Mom...We Miss You!! I knew it was coming...I just tried to ignore it. "Send a greeting card to Mom for her birthday...", it said. I let it sit here...in our inbox....for days. Somehow, having it sit here helped me pretend that she is still here. That I can buy her a card....and present. and/or cook one of her favorite meals. like she enjoyed doing so much. as we have so many times before. Thinking about it makes me recall so many, many happy memories. "Precious memories, how they linger! How they ever flood my soul! over the past couple of weeks, reminding us of her upcoming birthday. tears fill my eyes, and I miss her so much that my heart breaks all over again. since I stood there and watched them close the lid over that precious face. after just exiting a safe place to enter such a cruel, cold world. that smiles covered when something made her laugh. that I could think of nothing to say, if we had the chance to talk. I would do my utmost to show her the happiest 86th birthday possible. and the special birthday tablecloth would be on the table for everyone to sign. We would sing to her and try to make her feel as special as she deserves to be made to feel. I would make sure she was comfortable and had what she needed. And I would tell her over and over and over again how very much I love her. Did I tell her enough? Nearly every day of my life. I showed her...as much as I possibly could. But, did she really know? Did she realize how very important she was to me? Did she comprehend the depth of my concern for her? I can only hope that she did. I can do nothing for her now. would fall so hopelessly short of the kindness with which she is now being treated. than the arms that will hold her for eternity. to Mom today, on her 86th birthday, this is what I would say. It is so good to hear your voice again! I sometimes feel like I won't be able to go on without you. I am doing what you told me to...remember? while we waited for the ambulance to arrive? You told me you didn't think you would make it through that time. It turned out, you were right, Mom...you didn't. You told me to stay encouraged and to keep the faith. And remember that day in ICU? You had the bi-pap machine forcing air into your lungs. You were trying so hard to tell me something. The nurse took it off long enough for me to bend close to your face, so I could hear. Keep pressing on, you said. I have, I am, and I will, by God's grace. There have been moments I have felt the urge to give up. A lot has happened since you left us. Unexpected changes have come...both good and bad. But, through it all, I have not let go. and I must press on. You have won your crown. No one has ever deserved it more! I can just picture it...in all its glory...resting on your head. and to finish strong....just like you did. How I miss your prayers! Oh, the times I have wanted to pick up the phone and call you! Oh, the times I have needed you, Mom! to hear you quote Scripture to me! I miss our talks, our car rides, our trips down south, our prayers together. YOU were the best mother a girl could ever ask or hope for, Mom. You were not only my mother....you were my dear, precious, cherished friend. Will I ever stop missing you? and new things that have developed....since you were here. Those are the times I miss your prayers the most. I have even cried out to you...begging you to pray for me....there in Heaven. You must be so close to His throne! When you first saw HIS face? Remember your favorite song, When I Bow At His Feet? Oh, how I wish you could tell me! Or do you just rest? Do you think of us...down here? Or would that bring you too much pain? And all of those old-time saints you used to talk about so much? How does it feel to be rid of that walker? And to be out of that pain??? And to never have to worry...about us....or anything......ever again? What does it look like, Mom? Does He still have marks and scars from the nails? Is that how you first recognized Him? Is He the One Who carried you over....as you left us there in that dismal, depressing hospital room? Do you and Dad sing together? Oh, Mom, there is so much I want to say! with more love than my earthly heart could ever hold. And one day, I will meet you there, Mom. I promise, by God's grace, I will get there. Then, we will never part again." Our family circle broke in two when our precious Mom was called away. Sometimes, I feel so lost without her link. She was like the glue that held us together. they will never be the same without Mom. are things we will all miss for the rest of our lives. If you still have your Mom...and/or Dad...why not pick up the phone and give them a call? Why not drop by for a visit, if they live close by, or make plans to go see them, if they don't? Why not tell them how much they mean to you and how happy you are to still have them in your life? Unfortunately, there are no phones in Heaven. we must wait until eternity to speak with them again. So, if there are words that need to be said, why not say them now? and while you can still bless them with your words? Why do we procrastinate in these matters? Always thinking there will be a more convenient time. why not forgive and let go of the past? Don't let another day go by without mending fences and relationships. It just isn't worth the risk. Regret is a heavy, but unnecessary burden. to prevent those nagging, life-draining regrets. I will more than likely miss my parents for the rest of my life. makes the grief a tad bit easier to bear. I can't imagine having the sting of regret added to my already-overwhelming sense of grief. I thank God for every one of Mom's birthdays that He allowed me to spend with her. 45 of them, in all. I was blessed to keep her in my life a lot longer than a lot of people are blessed to keep their mothers. I am eternally grateful for every moment He allowed us to share. To anyone who grieves, I offer you my deepest condolences. But, more than I know, Jesus knows. He was a Man of sorrows and acquainted with grief. He will be there every time. "When my father and my mother forsake me, then the LORD will take me up." "As one whom his mother comforteth, so will I comfort you..."
Happy Birthday, dear, precious Mom! and we all miss you more than you will ever know. Ah, Cheryl! I weep with you today...it's been 6 years - or has it been 7? - since I buried my mother. I still cry remembering her and missing her. Guess I always will. I didn't have the opportunity for sweet last words, or to know for sure if I will meet her one day again, though God knows I've tried to help her understand grace. But God has comforted my heart, and allowed me to just leave it rest with Him. It doesn't matter how old you are, you still need a mother. God give you special blessings and hugs today, my friend! To my dear, precious sister! What a precious blog about our loving Mother! We miss her, too! The grief still gets overwhelming at times, but God is so faithful to gird us and comfort us> My heart truly goes out to anyone who has lost one or both Parents. While it may make you feel like an adult orphan, rest assured we have a "heavenly Father" who will sustain us through, and someday carry us to heaven to be reunited with our earthly parents, if we remain faithful! Praise God for that comforting thought! Love you more then you know! My dear, sweet sister! How I thank God that I still have you and our other siblings to comfort and share the sorrow! you are beyond precious to me, and I appreciate you so much. Yes, thank the dear Lord, even though we have lost our earthly parents, our dear Lord will never leave us nor forsake us. I love you more than you will ever know! So happy you stopped by. Dear Cheryl - thank you for your brave heart! Your sharing and love and your deeply moving tribute to your mom is something we all can appreciate, whether or not our parents are here in this world or the next. Seeing Dad standing with your Mom (and the rest of the family) is a reminder that, ultimately, we all stand together regardless. I know that as I try every day to make sure my mom is cared for and knows that she is loved as she faces her constant health struggles and wonders if she will ever walk again -- or live independently again -- I try my very best to offer her the most comfort and reassurance that I am here for her and that she has our prayers. It is so hard to watch your parent's health deteriorate before your eyes, someone who has loved and cared for you your entire life. But they've taught us that example, that being strong isn't just physical, but spiritual and mental as well. We can do it -- with the strength of Christ, and those who support us. God Bless You, and thank you for sharing your journey. I know beyond a shadow of a doubt that your dear mother sees everything you are feeling and going through, and that she is praying for you and rooting for you even as she watches everything from a unique vantage point :-). Don't ever doubt that she is aware of your trials as well as your love for her. She knows you miss her -- and I believe that she is right beside you as you talk out loud to her sometimes. Our loved ones are never really gone. Not as long as they live in our hearts.